1. In a 2002 scientific review, the Harvard School of Medicine recommended,“Pending strong evidence of effectiveness from randomised trials, it appears prudent for all adults to take vitamin supplements”. 2. RDAs are set at levels known to prevent nutrient deficiencies, yet it is questionable whether these levels are high enough to promote optimal health. For example recent medical research has shown that human daily requirements of vitamin D may be up to ten times more than what is currently recommended. Taking a daily multi can help to support these optimal levels. 3. In a study published in the June 2009 issue of the American Journal of Clinical Nutrition, researchers found that taking a daily multivitamin & mineral supplement may help to improve biological age. 4. Research shows that the typical Western diet supplies less than adequate amounts of several vitamins and minerals and nutrition surveys have found that large numbers of people consume too little calcium, magnesium, iron, zinc and possible copper and manganese. 5. A study published in the International Journal of Obesity found that in obese individuals, multivitamin and mineral supplementation could reduce body weight and fat compartments and improve serum lipid profiles, possibly through increased energy expenditure and fat oxidation. In addition, multivitamin and mineral supplementation helped to reduce blood pressure and serum CRP in obese women with increased cardiovascular disease risk. Ideally optimal vitamin and mineral intake would be provided through food, however most people don’t eat well, most of the time. Despite public health recommendations, a minority of people meet the recommended 5 daily servings of fruit and vegetables, and while there have been efforts to fortify foods with nutrients such as folic acid and vitamin D, this does not ensure nutritional adequacy. Add to these factors nutrient losses in food from processing and storage, as well as increased requirements due to alcohol use, chronic illness and increasing age, and it quickly becomes clear why suboptimal intakes of micronutrients are remarkably common. In fact, a scientific review on the topic from a team at Harvard University concluded that everyone should be taking a multivitamin. Multivitamin supplements are not intended to replace healthy eating recommendations; rather leading experts recommend they are used as part of a healthy diet and lifestyle. In summary, a high quality daily multivitamin and mineral supplement should complement healthy eating advice to ensure optimal daily nutrient intakes. When choosing a multivitamin it is important to ensure that you are making the best possible choice in terms of quality and efficacy. The Nutri range of multivitamin and mineral supplements are expertly formulated to provide high levels of important nutrients and are free from unnecessary binders, fillers and additives. From healthy bones and skin to a robust immune system, vitamins and minerals play so many vital roles in the body. Our multivitamins have been carefully formulated to contain all essential nutrients and – importantly – at significantly higher levels than many other leading brands. Support for your general health through the host of other vitamins, minerals and amino acids packed into each tablet. If you’re looking for something suited to your specific needs, we offer several targeted formulations, including one for those expecting a baby. Whichever you choose, you can be safe in the knowledge that our entire range is free from gluten, dairy and yeast. Achieve these benefits with the Nutri Multi Essentials range. Available as Men’s, Women’s and pregnancy with each Multi specifically developed to suit the requirements of these 3 groups. Ordering from Nutri is simple, call 0800 212 742. Their service is fantastic and you will receive the products very quickly. 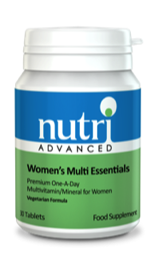 Women’s Multi Essentials is a premium multivitamin and mineral formula with targeted plant-based phytochemicals for female health. This specialised formula provides extra iodine and selenium for thyroid and antioxidant support and boron for bone health. In addition it contains broccoli, di-indolylmethane (DIM) and pomegranate extract for hormone balance, antioxidant support and skin health. • Easy to swallow, attractive pink tablet. 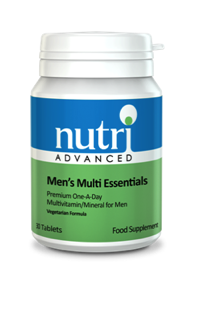 Men’s Multi Essentials is a premium multivitamin and mineral formula with targeted plant-based phytochemicals for men. It provides extra zinc and selenium and is iron free to specifically suit men’s unique nutritional requirements. In addition it provides phytosterols and lycopene for extra antioxidant, prostate and cardiovascular support. • Features vitamin K2, an essential vitamin for supporting bone and cardiovascular health. 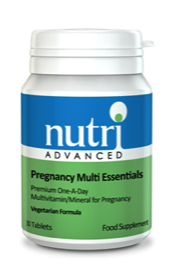 Pregnancy Multi Essentials is a premium multivitamin and mineral formula for support during pregnancy, pre-conception and breast feeding. It provides higher levels of important minerals, such as magnesium, calcium, zinc, iodine, selenium and iron, to support both mother and baby. • Contains 25mg of zinc per tablet to prevent deficiency. • Features higher levels of selenium to support healthy blood pressure during pregnancy. • Provides folate as 5-MTHF, the "body-ready" form of folate. 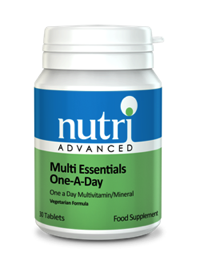 Multi Essentials is a comprehensive multivitamin and mineral formula suitable for anyone over the age of 12. Only one tablet per day is needed to support general health. It provides excellent levels of vitamins D, E and folate, as well as delivering good amounts of zinc, B vitamins, vitamin K2 and select amino acids such as l-lysine and l-glutamine. • Features 90mcg vitamin K2, an essential vitamin for supporting bone health.